If you’re looking for suggestions on the best piano keyboards, then you’ve come to the right place. 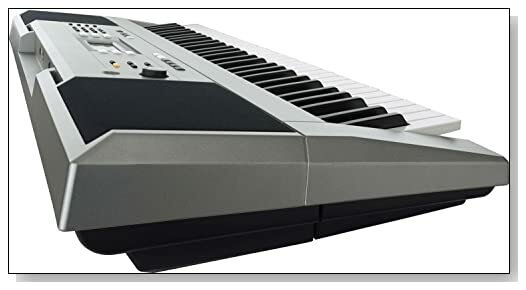 The following review is for the Yamaha PSRE353 61-key portable keyboard – arguably one of the best choices for beginners, and with good reason. Read on to find out what the Yamaha PSRE353 keyboard has to offer and whether it makes a good investment for you. As one of the oldest musical instrument manufactures, Yamaha was among the first brands to incorporate teaching software in their digital pianos. The PSRE353 portable keyboard continues this trend with its Yamaha Education Suite. The Y.E.S and “Keys to Success” lessons provide up to 102 preset songs for practice. Beginners and intermediate piano players alike can hone their skills with the wide range of on board lessons, which also support tempo adjustments to match the skill level of every individual player. When the engineers at Yamaha designed this piano, they also had music creativity in mind. This is reflected in the diverse range of playback features that come with the PSRE353 portable keyboard. Like most models in the PSR-E series, this keyboard features Yamaha’s patented AWM (Advanced Wave Memory) stereo sampling technology for creating refined and rich acoustic sounds. The features, however, don’t end there but instead keep getting better. When it comes to digital effects, you can add those magical notes to your tunes using functions such as harmony, reverb, master EQ, and chorus. Experiment with over 500 preset voices and more than 130 accompaniment styles to practice or create your preferred repertoire of music. The Arpeggio function adds inspiration and expressive musicality to your creations as well. This feature intelligently creates rhythmic and melodic patterns based on the notes you play. What’s more, the Ultra Wide Stereo presets allow you to compose wide, extended and dynamic sound fields. The melody suppressor is a great extra bonus for anyone who likes instrumental music. This feature is designed to isolate the melody in audio songs. Simply connect any audio device that has a line output to the AUX-in port and the melody suppressor will capture all your favorite tunes. As far as connectivity options go, the PSRE353 Yamaha portable piano keyboard is compatible with devices that have USB or AUX ports. You can connect both PCs and handheld devices like iPods and iPads via the USB to HOST port. Devices with audio jack connectors like headphones connect to the AUX interface. This Yamaha keyboard has touch sensitive keys. As a result, you can control the volume by altering the force with which you use to strike the keys. Press lightly and the sound will be soft. Strike harder and the pitch increases. Acoustic pianos work in the same way. Therefore, if you plan to switch to acoustic pianos, this keyboard prepares your fingers for them with its authentic feel. 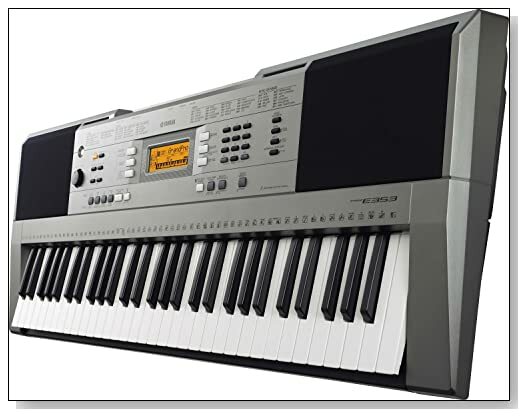 Other important features on the PSRE353 keyboard include track recording, Yamaha’s digital signal technology, auto power off mode with adjustable timer, internal music database, as well as dual and split player modes. This 6.6-pound keyboard is 42 x 16.9 x 6.6 inches in size. Various customers have rated Yamaha’s PSRE353 keyboard highly on a number of independent review websites. Although a few reviewers have raised some shortcomings like those pointed out in the cons section, the general consensus amongs buyers is that this digital piano offers good value for its asking price. The Yamaha PSRE353 61-Keyboard is a great choice for people on a budget who not only want to learn how to play piano, but also improve their skills. Hobbyists will find this digital piano a great learning and practice tool. The best part is that users get a host of features that make the keyboard a nice all-round musical instrument at this price range.